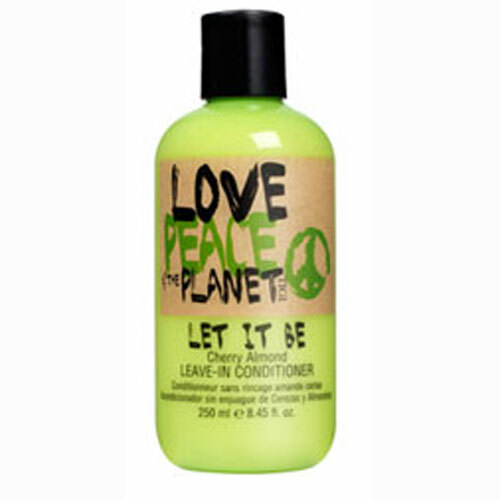 Love Peace Planet Let It Be is a leave in conditioner - 88% Organic: no Parabens, no artificial colors, no synthetic fragrances! Formulated with a special selection of biodegradable ingredients, it will rescue hair from despair with nourishment and shine. Love Peace Planet Let It Be Leave In Conditioner contains natural fatty acids and emollients, such as Shea Butter and Sweet Almond Oil which will richly moisturise for soft, supple hair and a conditioned scalp. Wheat & Rice Amino Acids penetrate hair to help to increase moisture retention, strengthen and promote a glossy finish, while chamomile extracts` aromatherapy fragrance, offers anti-irritant benefits for a healthy scalp. Get on the green scene and Let It Be. Dry hair will with towel before applying product � you�ll use less product since it won�t become diluted like it would in wet hair.